Google Pixel 2 is speculated to have the Snapdragon 835 Processor which is more or less same as the top tier Android phones in 2017. HOW DID GOOGLE PIXEL STANDOUT IN THE CROWD? The Google Pixel range of smartphones was introduced in 2016 and soon its next model version would be out in the market. Google Pixel was said to be the best Android phone in the market due to its fast Snapdragon 821 processor which gave it an upper hand and other alluring features to make it a superior. Due to the success of the predecessor, Google Pixel 2’s release is much awaited. Since the announcement of the successors has been out, all sorts of speculations have been going around like Snapdragon 836 processor from Qualcomm, no headphone jacks and more. IS PIXEL NO BETTER THAN OTHER ANDROID PHONES? In 2017, a number of smartphones have been launched. Each one of them have at least one feature that make them distinctive, making it difficult to decide on what to buy. With all these smartphones in the market, this time Pixel has to work hard to engage users. However, according to the latest reports, Google Pixel 2 and Pixel 2 XL would have the same processor Snapdragon 835 – not Snapdragon 836 – like any other high range phones of 2017. Snapdragon 835 has not disappointed users though but this rumor might have disappointed users a bit. Let’s see what surprise Google has for the users, even if the 836 processor is not included in the specification. It is believed that it will not dishearten Android lovers. YouTube’s new update has been introduced with new features, making it more engaging for iPhone loyalists. 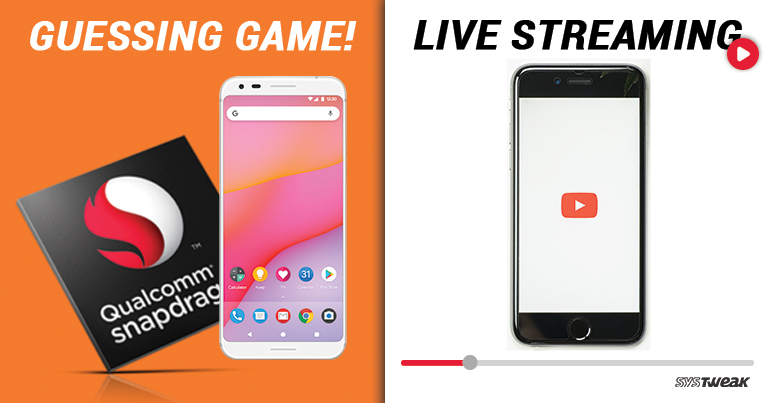 YouTube with its latest update has introduced attractive live streaming features for iPhone, i.e.it enables you to live stream in real-time with little latency. Moreover, it has also added new tools which make chatting and replying to the viewers easy. Earlier, the channel which had 10,000 subscribers or more was allowed to live stream. Subsequently, the number dropped to 1,000 in April and now the new number is 100. With 100 subscribers, anyone can live stream from their phone’s camera using YouTube app on both Android and iOS. However, this is not the news for today, according to the new update, whatever you are doing whether playing a game or working on a project on your iPhone, you can livestream it on YouTube. The feature was made available for Android earlier. iOS users got this feature later as YouTube implemented support for Apple’s ReplayKit. A fascinating feature added to YouTube app for game lovers, enables them to nudge your friends with your gaming skills along with their audio and video commentary. HOW DOES IT MAKE INTERACTION BETTER? With the new update, YouTube has introduced ultra low latency, and it is also good for responding to a viewer’s comment and question if you are on a live chat. Introduction of chat moderation tool is also one of the other highlights. With this feature, streamers can remove/approve their chat feed, all they need to do is press and hold “Alt/Option” key on a keyboard to pause the chat. Another option for chat moderation given to streamers, wherein YouTube will check and hold supposedly unsuitable message for the streamers to choose whether the message should be approved, hidden or reported. This feature would be enhanced with time and after observing what messages are objectionable for streamers. All these changes and improvements are inspired by the competition given by the new competitors such as Twitch and Microsoft’s Mixer. Today people turn to YouTube whether they have to watch sports, chat shows, new song videos or anything for that matters but now YouTube with these new features has also tried to cover the game lovers to increase its fan following. Bieber’s Full Monty Photos Should Worry Instagram Users!